There is nothing more rewarding than growing your own food. Most gardeners believe that home grown fruit and vegetables taste far better than their supermarket counterparts. Here are a few articles from visitors to The Gardening Guide about growing your own food. If you have an article you would like to see added to the site please email us with it and we will do our best to get it added. 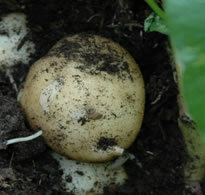 "I selected the Rocket potato and it is certainly living up to its name. Planting them at the end of March most of the very cold weather was behind us. Our soil has a clay and sandy content...."